We often speak of 'The Powers That Be'? Does this refer to Church? State? Personal Power? Powers ... Powers... Whose got the powers? Power and control by fear has always been a key element in the human experiment. At the end of time, there would come an uprising resulting in souls seeking self-empowerment and freedom. If you have control over your life, you are empowered. Another question comes to mind ... "How do I get my full powers back?" ... a sense of something lost. These are the powers that go beyond physical limitations and liabilities, into the realms of magic and manifestation. The soul reiterates, "Power is created by magic and illusion. Do you understand?" Magical powers, as we chose to perceive them, will not, cannot, return in the physical 'now', but at the end of the 'linear time experiment.' The dream is almost over. Can you sense it? Do you feel your consciousness waking up? Will searching for personal powers, one stops to wonder who created the human experiment? Where did it all begin? The rise and fall of human civilizations has to do with inserts in or consciousness program / hologram, all running parallel, created by the same blueprint or design, often referred to Masonic Architecture, and linked to each other at intersecting grid points. It is coming full cycle. Did humanity emerge Out of Africa? We see hear the SOUNDS of priests praying. Graphic reads: Rome 1139 AD. Camera shows a large office. Sunlight shines through stained-glass windows coming to rest on top of an old wooden desk. A robed man is seated behind the desk, writing a manuscript. A robed priest stands beside him. We see flashbacks of the Crusades. Camera shows the manuscript as the man signs it, Saint Malachy. He speaks in Latin with English subtitles. So shall it be at the end of time. Malachy removes something wrapped in fabric and turns to the priest who looks on. Camera shows a 12 inch relief heavily inscribed with a circle in the center. Malachy secures the relief in the tapestry and hands it to the priest who hurriedly leaves. We hear AFRICAN TRIBAL MUSIC and see the map of Africa. Graphic reads: Axum, Ethiopia 1937. We see the Italian flag and soldiers removing the Axum Obelisk. Lightning is seen and THUNDER HEARD as a large ominous cloud fills the sky. The soldiers stop working and look to the sky as the cloud blocks the daylight. Graphic reads: Rome Present Day. Flashbacks quickly display Malachy's image followed by the faces of the popes listed in his prophecies. Images slow down as we see the funeral of Pope John Paul II stopping with the installation of Pope Benedict XVI. Camera shows the Axum Obelisk. Two local workers mull about preparing the obelisk for shipment. They speak in Italian with English subtitles. the end of time will be near. Off-screen we hear something fall with a loud CRASH, startling the men. They search for the source of the noise, and find nothing. I fear that the spirits would agree. Worker 1 moves closer to Worker 2.
in several of the Egyptian obelisks. whose magic number is 33. Freemasons, 33 degrees, the Illuminati! Illumination and freedom from religious dogma. The men return to work as other workers join them. A third worker wears a uniform with the number 33 on it. The first 2 workers glance at each other. Archaeologists cheer after finding a vast network of royal tombs near the site where the 1,700-year-old Axum obelisk will be re-erected. Camera shows a small relief in the sand. A local girl picks it up, brushes it off and smiles knowingly. She looks around, then quickly rushes off with the relief, unnoticed. A cloud formation, high above, follows her. We see an ethereal looking realm with 2 ethereal entities each holding a relief. The girl, holding the third relief, stands before them. You have done well, Lucy. The script has guided my return. Lucy transforms into an ethereal being. The Powers That Be sigh 'in relief'. They move apart forming a triangle. The 3 reliefs float to the center, then blast into light as they merge and begin to spiral upward. The entities transform into light, joining each other to form a triangle of light which merges with the relief as if a Maypole. Golden archetypes of light appear. CELESTIAL HARMONICS are heard. Do you remember .... ? 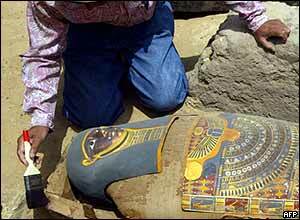 On Tuesday May 3, 2005 an important archaeological discovery was made in Egypt, the most beautiful mummy ever found. I thought of the screenplay above and the gorgeous image of the man and woman I found for the May Day Quote below. 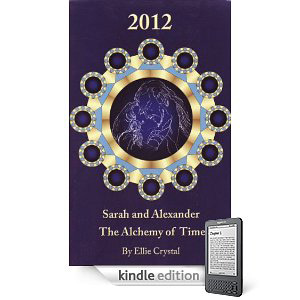 The image links to Egypt as well as Twin Flames, also having the same energies of the couple in the alchemy wheel on the cover of "Sarah and Alexander". 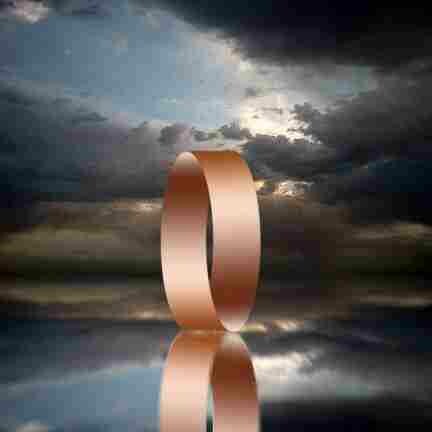 As the images depict ... there does exist a symmetry and rhythm in the design. Touch the sarcophagus with your cursor? What do you experience? 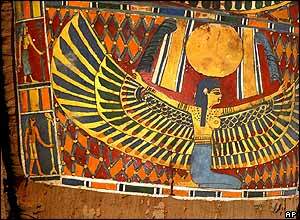 Now touch the winged image of Maat, Truth and Balance. She was Thoth's wife, twin flame, soul mate, consort, counterpart, or whatever they were into to help express that at the end of the program all souls must return to balance at zero point merge. 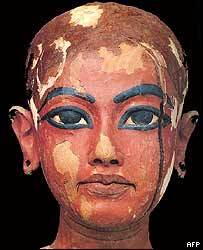 What message do you get from Ma'at and Thoth? 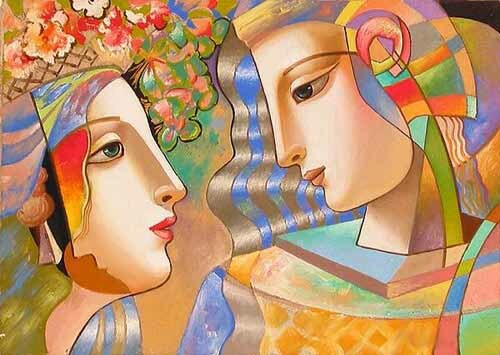 is in any manner a lover, springeth and flourisheth in lusty deeds. For it giveth unto all lovers courage, that lusty month of May. 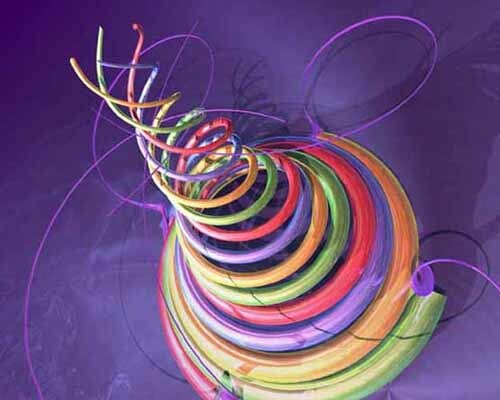 Spiraling cones remind us of the movement of consciousness. In the year 2012, Sarah Manning races against time to fulfill a prophecy set in motion by her ancient ancestors, the Guardians of the Seed. Connected to the ancient mystery schools, this epoch adventure, spanning 72 years, and crossing 3 continents, explains the foundations of reality, and the prophecies of time. In essence, the story of "Sarah and Alexander" is the esoteric history of the human race. The protagonist's struggle to pry open her family's dark secrets is also humanity's struggle to uncover its hidden past. This tale, written hard against the backbone of history, is awash with mythic overtones and replete with revelations of mystical realities. Journey with Sarah to unlock many of your own truths.